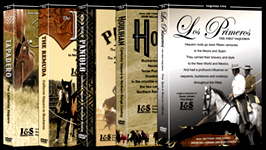 A passionately researched and beautifully filmed DVD about the long history and present day contributions of the Buckaroo by Susan Jensen and Paul Singer. In a remote Nevada cow camp, they jingle in the remuda. There’s a chill in the air, and steam rises up off the horses’ backs. The jigger boss’s rope whistles through the air, expertly landing on target. 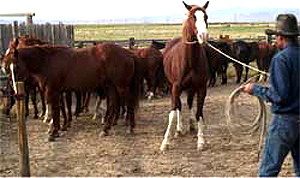 A buckaroo picks up a horse, halters and leads him to the corral. It’s a ritual that seems almost choreographed, but to a buckaroo, it’s just part of another day, an outgrowth of a tradition that goes back 300 years, to the original Californio Vaqueros. This is the story of how it began in Alta California, moved into the Great Basin country of Nevada and Oregon, and shaped one of the world’s greatest horse cultures. 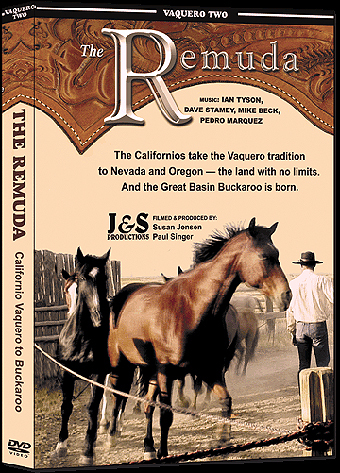 The DVD "The Remuda" picks up where "Tapadero" leaves off, and takes you to the land of the Buckaroo, the Great Basin Country of Nevada and Oregon. You’ll get an insider’s look at famous ranches, like the White Horse in the Owyhee Desert of Oregon and the TS in Battle Mountain, NV. You’ll watch as they wrangle in their big cavvys, and expertly rope out their horses for the buckaroos to go to work. You’ll see them branding on the open range, using skills passed down by their Californio forebears. In The Remuda, you’ll get a first-hand look at what this buckaroo life is all about, even get a front row seat at the Jordan Valley Big Loop Rodeo, where they rope wild horses with a twenty foot loop. And when the buckaroos come down California’s Tejon Ranch for an old- fashioned roping contest, you’ll get a vivid reminder of where it all began. The documentary is underscored by the original music of Ian Tyson, Dave Stamey, Mike Beck and Pedro Marquez. The Vaquero roots go back fifteen centuries to Spain, the Moors and Mexico. He carried his bravery to the New World and had a profound influence on the California Vaquero and his horsemanship. Filmed in Spain, Mexico and the American West. Tapadero is the story of the Californio Vaquero and how he became one of the world’s greatest horsemen. 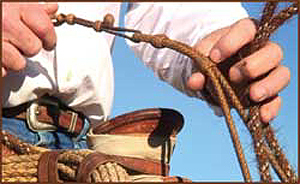 It uncovers the secrets of the spade bit horse and rawhide reata, and introduces you to the mainstays of vaquero horsemanship, past and present.